You are here: Home / How to Play Piano / Piano for All review: Can You Learn Piano via eBooks? 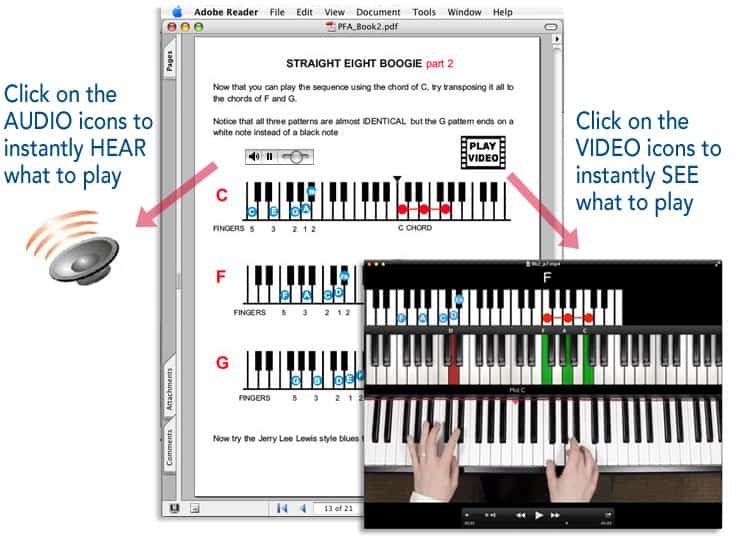 Piano for All review: Can You Learn Piano via eBooks? 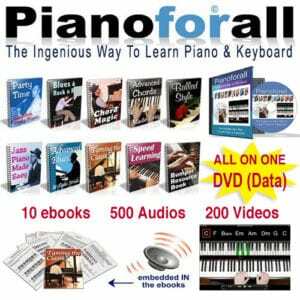 In this article, I’d like to discuss a piano learning course called Piano For All, which is a series of eBooks (via download or sent via DVD) featuring embedded audio and video lessons aimed at getting you comfortable and successful at playing the piano. 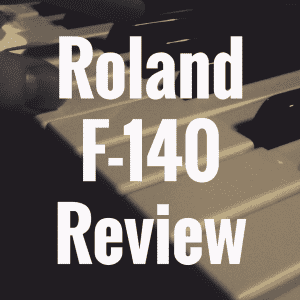 Priced at a very affordable price, this review will try to answer the most obvious question—can you successfully learn how to play the piano through an eBook course that costs less than $100? In fact, the digital version of Piano for All only costs $40, which is sometimes the cost of a single lesson from an experienced teacher (and that’s being generous). In this instance, the writer of this program, Robin Hall, is your teacher, only it’s much cheaper and is accessible whenever you need it. I’ll start this review by talking a little bit about the program itself, an overview, with some interesting things I’ve personally noted about it. Then, I’ll talk about the ways in which it succeeds, and ways in which I think it could use improvement. In the conclusion of this review, I’ll determine whether this is a suitable substitute for a real teacher, or perhaps a supplement instead. I’ll also provide you with my rating of the course, as well. As someone who teaches piano, I am always interested in new programs that help students get better by using new methods. This program focuses heavily on blues, pop, jazz, and rock songs by popular musicians of decades past, and uses them as a tool to implement learning strategies that will actually allow the student to be able to play “normal” music instead of boring kids’ songs. Each of these books focus on different areas of learning the piano. For instance, book 3, chord magic, does not focus on melodies at all, but instead shows you how to comp every single major and minor triad (there are 24 of them) as well as how to form inversions. As you learn new chords, the book helps you follow along with songs, both in audio form and on paper. Integrated into each book is a series of audio files you can click on in order to play, so that you can play along with the instructor. This is a very creative way to help people who are more inclined to learn by ear. Book 3 goes through all of the chords beyond the simpler keys, such as C, F, and G. It doesn’t miss any of them, and implementing them into your vocabulary is made simple through listening and playing along. The book ends by introducing the a “cycle of fifths,” which I would refer to as a circle of fifths (but that’s neither here nor there). It’s the same thing, although it goes counter-clockwise in this book, which is admittedly a little confusing for me, personally. As you complete each book, you of course move onto the next one in the series. One of the great things about having all of these lessons in book form is that you can go back at any time, go at your own pace, and you won’t forget things as quickly because you can recap things you want every single day, rather than once a week with a teacher. The last book is a book full of resources and extra supplements, with useful information on things such as how to pick the best MIDI keyboard, and more. This is a great little bonus, and it’s definitely worth reading. 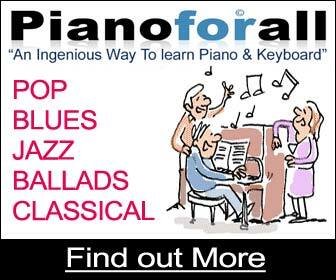 If you’re interested in learning how to play piano or keyboard in a fun and interactive fashion, then look no further then Piano for All. This course features 10 in-depth eBooks that contain 200 video lessons and 500 audio lessons. And best of all, the course works on PC, Mac, iPad, iPhone, or any Android phone or tablet. Get your copy of Piano for All today while supplies last! One of the big benefits I see about this program is that there is a large library of videos you can watch in order to play what the instructor has written on the page. He will show you slowly how to form each chord or note and where it is on the keyboard, in case you forget. I’ve seen these kinds of tutorials on YouTube before and I’ve always thought they were a great idea. In this program, every video is meant to be watched during a specific moment in your learning experience. So for instance, in book 2, when you first start learning the blues progression, you can follow along with the instructor so you don’t get lost. Now, one problem with this feature, is that your computer might not be in front of your piano. If you can find a way to get your piano near your computer, or use a laptop, you’ll have no problem following along with the videos. So just keep that in mind. Since we’ve already used book 3 as an example for this review, I wanted to mention that there are definitely some unique tips and tricks that you might not learn about anywhere else. I can’t say that for sure, of course, but I’ve taught for a long time and I know my methods, so learning new ones is always refreshing for me. Let me give you an example. In one video, the instructor talks about an easy way to remember how to shape both major and minor triads in their root position. 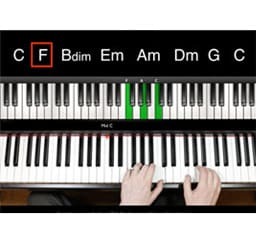 With the exception of the B chords, every other chords’ root and fifth notes are on the same color keys. So, for C minor, it’s C and G. With C# minor, it’s C# and G#, both black keys, and so on. This program is peppered with things like this that you might not find anywhere else. The idea of utilizing both audio and video to turn a virtual experience into a compelling, visual instruction lesson is compelling to me. I think there are a lot of really interesting ideas and techniques in the Piano for All course, and there are definitely a lot of ways in which this program looks quite promising. I think a lot of teachers underestimate the power of hammering chords into students’ minds. In teaching culture, it’s really common to focus on the melody, the right hand. I figure this is because a lot of teachers want students to feel like they’re having a lot of success, and people with untrained ears really only hear melodies anyway, and they kind of tune out chords. Subsequently, the right hand gets preferred over the left hand—the left hand kind of gets left out for the first several months of teaching. Students who are right-handed dominant tend to also prefer the right hand because that’s the hand they’re comfortable with. This program doesn’t really let you get away with not using the left hand. There is a really strong emphasis on playing rhythm piano right off the bat, which is really unusual for a teaching course. And of course, rhythm piano requires heavy use of the left hand. Because of this, I could see a lot of students having earlier success with their left hand usage than their traditional counterparts. And I really appreciate that. I think it’s important to treat both hands equally, because it will only benefit the student in the long run. In book 2, one of the first things the instructor says is that the left hand should be practiced long before the right hand. He knows that people are mostly naturally inclined to be better at their right hand parts, so he doesn’t worry about it. It’s a clever approach to the problem, for sure. This emphasis on chords will only help students professionally. 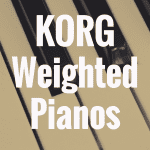 Pianists in bands need to know their chords, even if they’re not doing intense jazz. This approach can help students read charts given by bandleaders, and most importantly, to help them play by ear, which is crucial. The implementation of both audio and video is something real teachers can’t always do so easily. This is a wonderful supplement to the course, and is a total benefit. According to Piano for All’s website, there are ten hours worth of audio and video, which is quite a lot when you think about it. That equals 20 half-hour lessons from a real teacher. The last thing I like about this program is that it’s incredibly cheap. I could see people paying $300 for this easily, but for $40, it’s really quite amazing what you get. One thing I noticed that might be more useful is that it seems like the fundamentals are somewhat neglected immediately after book 1. While I appreciate that the purpose is to build on concepts really quickly and move forward, I would appreciate a recap of rhythm and counting in book 2 for instance, just to solidify some good practices. Now, while I do like the overall structure of this program, I do feel like there’s some merit to the traditional way of learning, in which you learn more about the terminology prior to learning how to play, so that beginners can understand why things are the way they are. That being said, I find that a lot of the ways that make it possible to learn other styles of music, like classical, are somewhat put in the backseat to make way for more accessible learning. This is useful on one hand, but on the other, piano is also something that’s important to take slowly and digest. I can see this style of learning working for a lot of beginners, but some of them might want to go a little deeper, and might not be interested in learning blues and rock n roll, and prefer things like classical music. Now, book 8 does get to classical music, and I think this is a great inclusion. I might have rearranged the order of some methods just so that students could have a more proper foundation before switching to classical. But that’s more of a personal preference rather than an outright criticism. One technical thing I’ve noticed is that if you want to listen to the audio on a page, but scroll to another page for reference, the audio will stop playing. It’d be nice if the player was more integrated across every page so the student could flip through them while listening. For the video, this isn’t as much of a problem, because you’re supposed to be watching the video anyway. In fact, keeping your eyes on the video is a great way to stay focused and absorb it. Let’s face it—people love watching videos, and I think this is a creative way to keep students’ attention. I have to dock a couple of points off this program for aesthetics, as well. The information is really great, but it’s visually unappetizing. While this might not bother anyone, I think it could have been designed to be more attractive so that students will feel more inclined to learn because of easy-to-see visuals. For instance, all of the keyboard visuals bother me because they feel like they’re cut off on the top. Having distracting visuals could potentially pull the student out of the zone, and I think that’s a slippery slope. 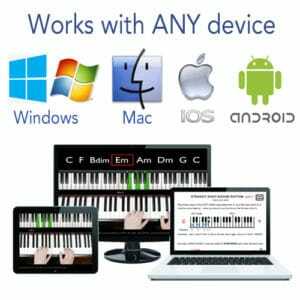 Piano For All is great because it’s convenient, inexpensive, and you can use your cheap digital piano to follow along without worrying about not having enough keys. Its video and audio integration works well for the most part, and I think it’s largely beneficial. I think the benefits of having someone experienced like Robin Hall showing you the tips and tricks and secrets of making learning fun and easy are worth much more than he charges. It’s $40, unless you want the DVDs as well, which I don’t know if you need them, because you can stream all the audio and video through your computer. So, is this a replacement for a piano teacher? Well, in a lot of ways, I think it could be. With that said, I think there are ways in which the videos don’t always explain everything you need to know. On top of that, if you have a question, what are you supposed to do? You can certainly email the creator of the eBook, but that’s no doubt going to be a different experience than turning to your piano teacher in person and getting an immediate answer. But, you’re also buying this course for convenience and price, too. That cannot be undersold, here. With Piano for All, you learn on your time. Your schedule. And at a massive fraction of the cost a teacher would be. If you’re still interested in learning how to play piano or keyboard, get your copy of Piano for All today, which features 10 eBooks, 200 video piano lessons and 500 audio piano lessons! 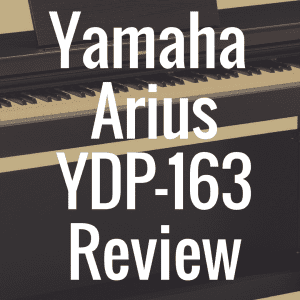 Digital Piano Review Guide is an affiliate for Piano for All and receives a commission for every sale of the Piano for All eBook course. If you enjoyed this article, please “like us” on Facebook! 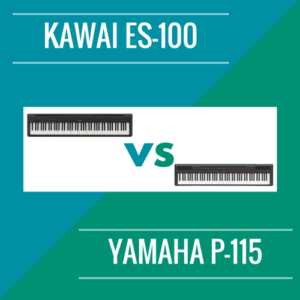 What’s the Best Way to Learn Piano at Home? Is There an Easy Way to Learn Piano? 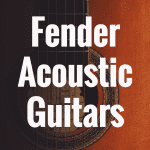 What are the Best Fender Acoustic Guitars? 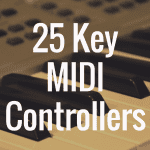 What’s the Best 25 Key MIDI Controller Available?